In honour of Jew of the Week’s 7th birthday this November, we will feature a month-long series on the most famous (and sometimes infamous) Jewish family of all time: the Rothschilds. This is part two of five. Click here to see part one. The eldest son of Mayer Rothschild was Amschel Rothschild (1773-1855). He continued his father’s business in Frankfurt, and was made a baron in 1817 (becoming “Von Rothschild”). He was the most religious of the brothers, and tremendously helped poor Eastern European Jews, who nicknamed him “the pious Rothschild”. Unfortunately, he died childless, so his Frankfurt branch was taken over by siblings and nephews. The branch was permanently shut down in 1901. Mayer’s second son was Salomon Rothschild (1774-1855), head of the Vienna branch. He played a huge role in Austria’s history, sparking its industrial revolution, igniting the Austrian economy, and financing massive public projects, including Austria’s first railway network. In honour of this, Emperor Francis made him a baron in 1822 (making him Salomon von Rothschild). Ironically, he was still not an Austrian citizen, which Jews were barred from! It was only twenty years later that he was officially made Austria’s first Jewish citizen, paving the way for equal rights for all Jews. Unfortunately, just a few years later, a wave of anti-Semitic riots broke out in Austria, with Rothschild being its main target. He had to hand over his bank, and fled to Paris. Many of the precious artworks that he collected he donated to the Louvre. The Vienna branch of the bank would ultimately be put to an end by the Nazis (having already suffered a devastating blow during the 1929 stock market crash). The Naples branch went under even earlier, during the Italian Reunification. It was founded by Kalman “Carl” Rothschild (1788-1855), the fourth son. He transformed his bank into the dominant financier in Italy, and was also made a baron. One of his clients was the Vatican Bank, and witnesses were shocked that Kalman never kissed the Pope’s feet, which everyone – even kings – had to do in those days when meeting the Pope. Kalman died in the same year as his oldest brothers, perhaps from grief after his wife and son tragically passed away as well. The remaining two sons, in London and Paris, would become the most influential Rothschilds by far, establishing institutions that continue to operate until this day. Their life and achievements will be explored next week. Click here to go to Part Three. 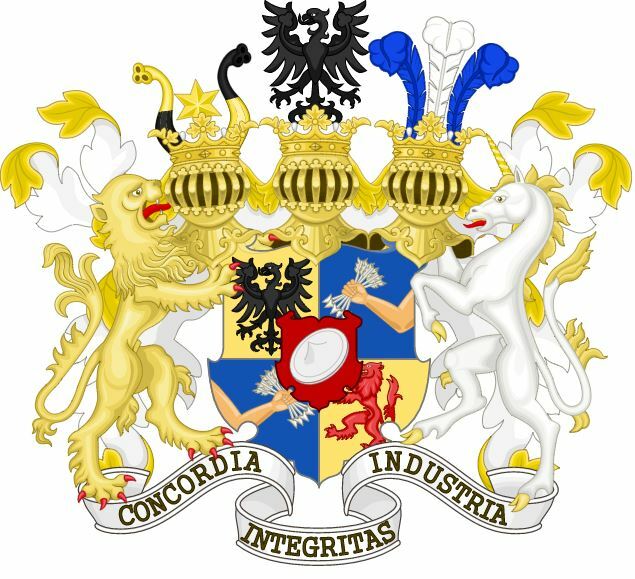 Rothschild Coat of Arms. Among the interesting symbols is a Star of David at the top left, and a hand holding five arrows, representing the five Rothschild sons, based on Psalm 127: “Like arrows in the hand of a warrior, so are the children of one’s youth.” At the centre of the logo is a red shield (for “Rothschild”) with an image of the “Judenhut”, a hat that Jews were forced to wear in Europe to distinguish them from others. This entry was posted in Business & Finance and tagged Amschel Rothschild, Anti-Semitism, Austria, Austrian Jews, Bank, Banking, Baron, Citizenship, Finance, Frankfurt, German Jews, Germany, Industrial Revolution, Italian Jews, Italy, Kalman Rothschild, Louvre, Naples, Pope, Railroads, Rothschilds, Salomon Rothschild, Stock Exchange, Vatican Bank, Vienna on November 8, 2017 by Jew of the Week. Elio Toaff (1915-2015) was born in Livorno, Italy, the son of Livorno’s chief rabbi. Despite the fact that his father did not want his son to follow in his footsteps, Toaff nonetheless pursued religious studies (as well as law and theology at the University of Pisa) and was ordained a rabbi by age 24. At 26, he was appointed rabbi of Ancona. Not long after, Germany occupied northern Italy, and Toaff became a resistance fighter. Captured by the Nazis and sentenced to death, he managed to escape while digging his own grave. Following the war, Toaff became the rabbi of Venice, and a professor at its university. In 1951, he became the Chief Rabbi of Rome (and, in effect, the Chief Rabbi of Italy) a post he held for 51 years until retiring in 2002. He had the monumental task of restoring Italy’s Jewish communities after the massive destruction they experienced during the war. Rabbi Toaff focused his efforts on rebuilding Jewish infrastructure, reigniting Jewish education, and bridging the gaps between Jews and non-Jews. 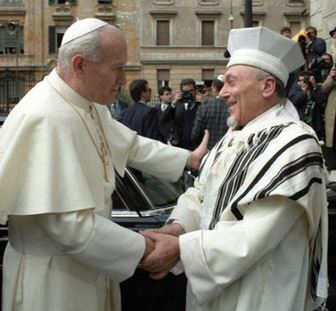 In 1986, he invited Pope John Paul II to Rome’s Great Synagogue for a joint prayer. The Pope accepted, marking the first time in history a pope visited and prayed at a synagogue. The two had a very close relationship. Incredibly, Rabbi Toaff was one of just two people that the Pope mentioned in his last will and testament (the other being the Pope’s personal secretary), writing “How can I fail to remember the rabbi of Rome?” Rabbi Toaff cleared the way for the Pope to visit Israel in 2000, and to establish formal diplomatic relations between the Jewish State and the Vatican. Rabbi Toaff was beloved by Jews and Catholics alike, and was a central voice of morality in Italy, as well as the primary authority in Jewish law. Toaff was knighted by the Italian Republic, and given the title of ‘Senator for Life’. He was commonly nicknamed “the Pope of the Jews”. Sadly, Toaff passed away on Sunday. He would have turned 100 years old next week. A rabbi doesn’t work only for his community or for the Jews. A rabbi has to talk to every human being who needs him. He belongs to everybody. He is for everybody. This entry was posted in Religious Leaders and tagged Ancona, Chief Rabbi, Holocaust Survivor, Italian Jews, Italy, Knight, Livorno, Orthodox Jews, Pope, Rabbi, Resistance Fighter, Rome, Senator for Life, Sephardic Jews, University of Pisa, Vatican, Venice, World War II on April 22, 2015 by Jew of the Week.